Set includes 5 various branches. Actual branches measure 10"x15", 11x17", 12x18", 16x30" and 16x36". Two Butterfly stencils are included for FREE! Get all 5 branches of our beautiful Clematis vine stencils in one kit and save! These Clematis stencils capture the perfect proportions and graceful curves of a real garden clematis vine in bud. This stencil motif makes a stunning accent above the sofa or table, above the bed or pretty much any wall space. Overlap it, use different colors, create your own allover stencil pattern, add shading - possibilities are endless. Use it over simple latex paint, plaster, faux finish background and even wallpaper if it is in decent condition. Great for murals! Perfect for nurseries, bedrooms, dining rooms - just change your color combo. These stencils are so easy to use, virtually anyone can do it. Simply tape the stencil to the wall using BLUE painter's tape, then load your foam roller with a paint of your choice (latex or acrylic). Offload the excess paint on a folded paper towel. Then, just roll over the stencil applying medium pressure for an instant fabulous result! Don't press on the roller too hard otherwise you might get some bleed. We find that it is not necessary to use spray adhesive with our stencils, however if you want very crisp edges or are using high contrasting colors, please use it (Elmer's spray adhesive seems to be the best). On the pictures above I didn't use spray adhesive and still got nice and crisp edges. 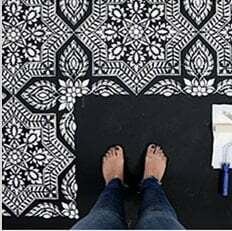 The trick with stenciling is to take care not to over-load your roller or brush with paint and not to press too hard on a roller while stenciling. I personally prefer just to use blue painter's tape to secure the stencil, but for beginners I would recommend using spray adhesive just to make sure you get great results. Stencils are made made out of durable 12 mil clear plastic stencil material. This material is strong but flexible, reusable and easy to clean. We love it so much more than standard 8 mil Mylar! It's not brittle, user friendly and just so easy to work with. In our many years of professional stenciling this material has proven to be far superior than any other stencil material we used. Our customers love it too, and we are sure that you'll notice the difference! Our stencils will last a long time and are a pleasure to use.